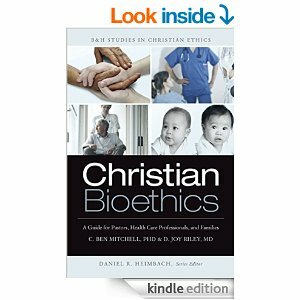 What Does God say about Bioethics? This book, subtitled A Guide for Pastors, Health Care Professional, and Families, is part of a series on Christian ethics published by B&H Publishing Group. I dare say anyone within each of those groups would be challenged to think more biblically about the relevant issues as well as being better informed by reading this book. In the preface, the series editor tells us the thesis of this book by asking this question: “How do we move from an ancient text like the Bible to twenty-first-century questions about organ transplants, stem-cell research, and human cloning?” This book, written by an ordained minister of the gospel (C. Ben Mitchell) and a physician (D. Joy Riley), gives solid counsel and these emotionally charged issues in 9 chapters, and is broken up into four parts: Christian Bioethics, Taking Life, Making Life, and Remaking/Faking Life. The format of each chapter is a look into a real life situation immersed in the subject, followed by questions for reflection, and Q & A between the authors. Other than a too frequent quoting of Roman Catholics as though that Church is Christian institution, this team provides solid insight from God’s Word on each of these topics. Chapter 1 gives the reader an overview of the Hippocratic Oath which opened my eyes to the ancient context and false gods the oath was originally made to and the awareness that most doctors today do not subscribe to this oath, which we mostly know as the pledge to, First, do no harm. This was spelled out in explicit language that forbid euthanasia and abortion. The absence of a doctor’s oath to “do no harm” may cause a patient to wonder how much he can trust his doctor. In summing up this topic our physician author observes (page 22, italics in original) “Doctors should work hard to be trust-worthy and humble.” A few pages later (page 28), as they address stem-cell research, our minister reminds us, after quoting 2 Peter 1:3, “God has not left his people without guidance in every area of life. Although the Bible is not a science textbook, its message speaks to the deep underlying values that can guide decisions about scientific matters. Although the Bible is not manual of medicine, its truths may be applied to medical decision making.” This is a key perspective for every child of God to properly understand how to walk in the light of God’s Word. Much of the rest of chapter 2 is good advice for properly reading and understanding the Scriptures, taking into account literary, historical, and cultural context as well the genre of what is being read. The chapter addressing abortion is sobering and probably eye-opening for most. The authors make a full-court press to establish the humanity of every life, starting from conception. Mitchell makes the essential connection between our view of Jesus and our view of humanity, developing the humanity of our Lord to show how every mortal is given value by the Creator – above all other life forms – from the time the egg is joined with a sperm. At the end of chapter 3, the authors exhort Christians to be active in opposing abortion and supporting life, but they draw no lines of getting involved with pro-life Roman Catholics. Christians must be deliberate and biblically thoughtful in deciding who to get cozy with in the public arena. The next chapter covers death and dying, providing thought-provoking observations about the details of pain and suffering and how one’s Christian world view informs us. A key element in handling the death of any person, they tell us, is to remember the patient (perhaps a close relative) is a human being, not merely a patient to be treated. “Much of the suffering of dying persons comes from being subtly treated as nonpersons.” (page 85) There is discussion of the efforts to extend life, even at the expense of that life being human. It is a long-held desire of fleshly human beings to grasp eternal life in our present form, without submitting to God’s revealed plan of redemption – which includes our death and resurrection. Being a faithful child of God includes how we approach death – do we trust our heavenly Father in our dying as did our Savior? Again, we get faithful advice (pages 100 & 101): “Through the resurrection of Christ, God has given us grounds to hope that death, however awful, will not have the last word.” Amen! As they move from taking life to making life, the reader is presented with a biology lesson on how babies come into the world. They take this opportunity to reinforce the Christians view of anthropology (page 113): “Knowing that pregnancy occurs at fertilization rather than at implantation will help us make several important distinctions later.” They then cover several options medicine has provided for artificial this or that, discussing the line we cross regarding family integrity and God’s authority, observing (page 123), “When a third party intrudes on the procreative relationship, the divinely instituted structure of the family is altered. Trouble is bound to follow.” This may be unwelcome by some, who have such a great desire for a child that their love for the Word of God is overshadowed. All of us fall into this pit on one issue or another from time-to-time, so let us not rush to judgment. The quest for the good life. And while there is much more in this book that will do the reader much good, I think that is a wonderful point on which to end this review. Christian – are you content with our God’s provision in your life? Do we think we deserve better than YHWH has given us? To quote the Apostle, “Who are you, oh man, to answer back to the One who made you thus?” Let us, as did the Lord Jesus, trust ourselves to the One who judges justly. Trust God, rejoice always, pray without ceasing, give thanks in all circumstances, for this is the will of God for you in Christ Jesus. In living and dying – and all that comes between those two finite points. This entry was posted in Abortion, Bible Reference Notes, Creation vs Evolution, Encouragement, ending life, Expository Moments, Marriage, Parenting, Recommended Books, Reviews, Social Issues, Sola Scriptura and tagged Apologetics, Bible, Christianity, Gospel, Jesus, Religion, Theology. Bookmark the permalink. ← Why Did Jesus Come? This raises an interesting question, at least in my mind. Since, based on this review, the author seems to feel that medicine to get around infertility is sinful (through the implication that it is attempting to “open the womb”), what does or would the author say about medicine to dull the pain of childbirth, something that is explicitly ordained as a punishment by God? The authors of the book do not categorically oppose all medicinal efforts to address infertility, they do caution about people being more determined to have a baby than to trust in God and His provision – even if it means not giving birth to a child. And no – they do not advocate withholding pain relief, in childbirth or other circumstances. They consistently encourage thoughtful care by doctors and thoughtful requests by patients.